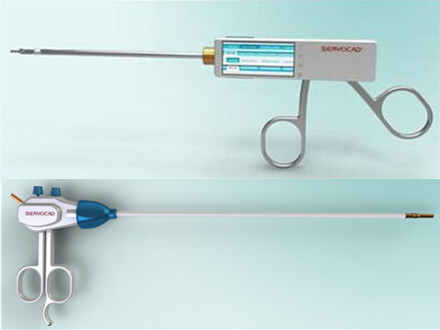 In collaboration with cutting-edge clinics, research institutes and universities, Servocad researches, develops and manufactures a wide variety of instruments, for use in solutions for non invasive surgery, odontology, ophthalmology, arthroscopy, laryngoscopy, otolaryngology, orthopedics and industrial ultra precision tools. Through its own advanced technology, the company offers avant-garde solutions through CADCAM to specialists, general surgery and dental laboratories around the world according to standards of very high precision in centralized milling centers and available in a wide variety of materials. In today’s highly competitive global marketplace, it is essential that we focus on the critical drivers of our future growth, that is to create value through innovation, to develop our global reach, with local focus. Laparoscopy manually operated, with the important development to have head tilt fully incisive tool. This head can get multiple spatial positions of surgery for optimal work, and is also very simple to use, thanks to the design of laparoscopic clamp, which controls all movements from the same thimble scissors, very intuitive and sensitive for the user. This tool can be easily reusable as it can be cleaned and sterilized by ordinary methods, gradually incorporating also disposable versions, designed with a variety of highly resistant medical materials, very ergonomic and light. Parallel close electronic tweezer is the first multipurpose tool with electronic handle for surgical application. It incorporates as a worldwide innovation, the intelligent pressure control between its robotized jaws with a high technology design through the miniaturization of all its mechatronic components. Its control system, fully digital, allows you to vary its parameters of use in an easy way, obtaining different levels of pressure depending on the tissues on which it must act and react. 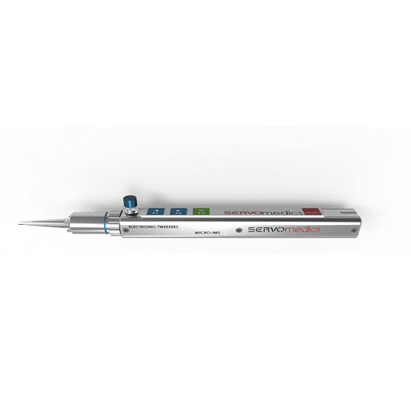 This novel system is designed to be 100% waterproof, is resistant to all liquids and is prepared to be sterilized, fully focused for use at a surgical level. The Servofix® fixing System has multiple applications for both manual and automatic tools. Its potential use can be of great amplitude (medical sector, industrial, air space industry). 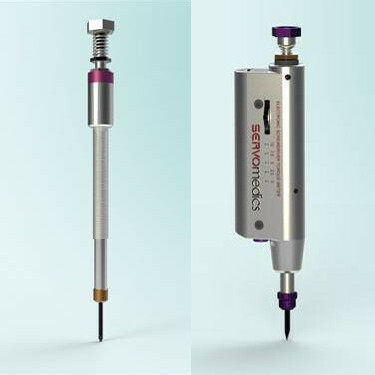 First commercial solution applied to manual screwdrivers: Servocad Microtronics has designed, firstly, a range of screwdrivers and keys for manual use, with built-in self-fastening system, specially designed for the precision positioning and easy handling of all type screws, torx, flathead and hexagonal head not magnetized or difficult to manipulate. This novel system was initially conceived for dental use for the safe placement of dental implants, providing greater security in the placement intervention, avoiding possible problems in the manipulation of the same, with consequent increases in costs as implants replacement. Due to its nature and design, this fastening system can also have multiple applications in industrial sectors where precision is a fundamental part of its production process. We specialize in product design technology, where interaction between different specialties, electronics and mechanical engineering applications together with a good level of conceptual design.